08 Dec 2018 / 14:20 H.
Participants march at Dataran Merdeka. 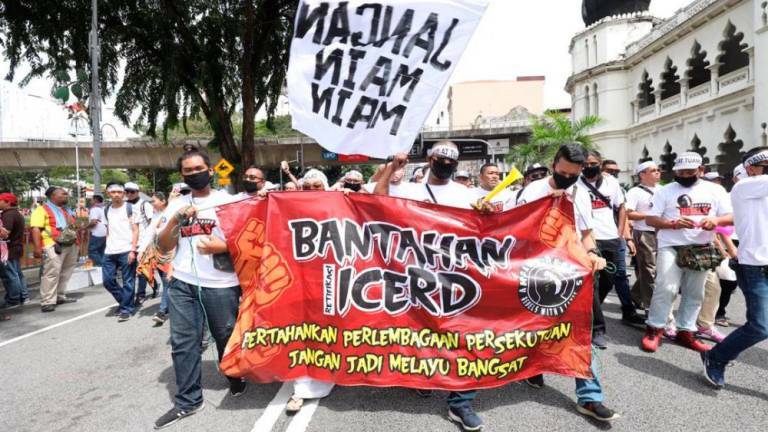 KUALA LUMPUR: Groups of people clad in white have already started to gather in the city, with at least 2,000 people in front of Sogo at Jalan Tuanku Abdul Rahman here at 1pm. Traders were seen setting up stalls selling t-shirts and masks. Many of those attending the rally to thank the government for not ratifying the International Convention on the Elimination of All Forms of Racial Discrimination (ICERD) were in the city as early as 10am. The crowd is expected to make their way to Dataran Merdeka for the rally at 2pm. Police were present in the areas surrounding Dataran Merdeka, with traffic and other personnel on standby. Police’s Federal Reserve Units (FRU) are also on standby near Jalan Tangsi.